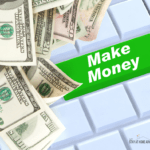 How to make money fast for kids is a question we get asked a lot around here. The good news is that today you are going to learn the answer to this question. Your children probably bug you for money on a regular basis. It’s always something. It might be a new toy, the latest video game, etc. I know my son love his Roblox and Hot Wheels and continue to ask me how much money I have left. This translate to I want money to buy something. While teens can get a job, little kids don’t have that option. 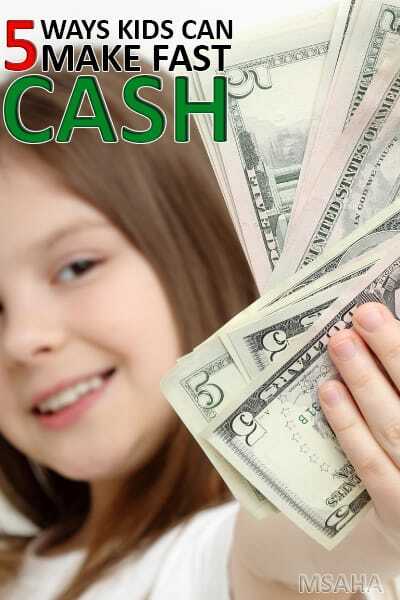 The good news is there are so many ways for kids to earn money fast. You may need to help them a bit, but encouraging them to work for their money at an early age can instill the drive to work for what they want. Let’s look at how to make money fast for kids. For the next playdate, invite your friends and their kids to your child’s yard sale party. 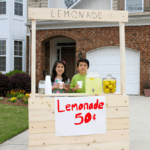 This is a great way for your child to earn money and help clear clutter from your home. Help your child go through all his things to weed out things he no longer plays with, books he’s outgrown, clothing that no longer fits, etc. The difference between this and a regular yard sale is that it’s open to friends and it’s more of an entertainment option. The kids can play and shop and the grownups can talk and take a breather. Your child probably has chores he does on a regular basis. You can add chores to the list in order for him to earn money fast. The exact chores will depend on the age of your child. Whether you have your child do yard work at home or let him do work for neighbors, yard work is always a great way for kids to earn money. There are things that need to be done year-round. Your child could pull weeds, rake leaves, shovel snow, water plants, etc. Your child may have some more expensive items that he’s outgrown. For example, he may no longer play with the motorized Jeep he got for Christmas a few years ago. These can be resold through Facebook groups for good money. The exact price will, of course, depend on the condition. Other items may include larger playsets, gaming tablets, and Lego sets. Yes, a lemonade stand is the most popular option. That doesn’t have to be the only option though. When the weather starts to turn cooler, your child could sell apple cider or hot cocoa. Your child could even sell packaged snacks. Hit up Sam’s or Costco to purchase the items in bulk for resell. Your child gets the profit and you get your money back for the initial purchase. Even little kids can earn money. As a parent, you don’t want to just hand over money any time your child asks for it. 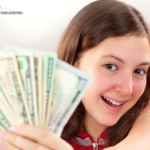 Look for ways for your child to earn that money. It might be selling items he no longer needs or doing chores for you or a neighbor. Either way, this will help teach your child that hard work can allow him to earn the money he wants. Sign up for our newsletter and receive our Kids Lemonade Stan Planner for free. 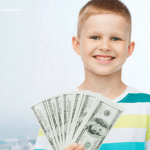 Your turn: You just read how to make money fast as a kid and now we want to know what are other tips and ideas you have. Share them with us.